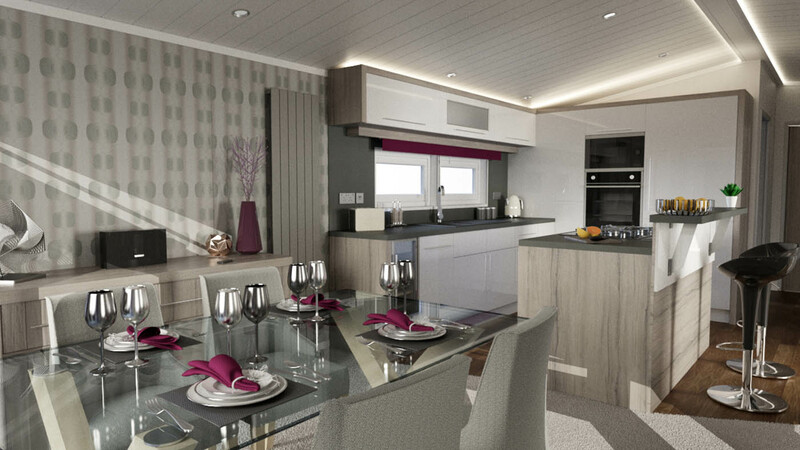 The Whistler Lodge is an all new twin unit that epitomises exceptionally spacious living and high quality. 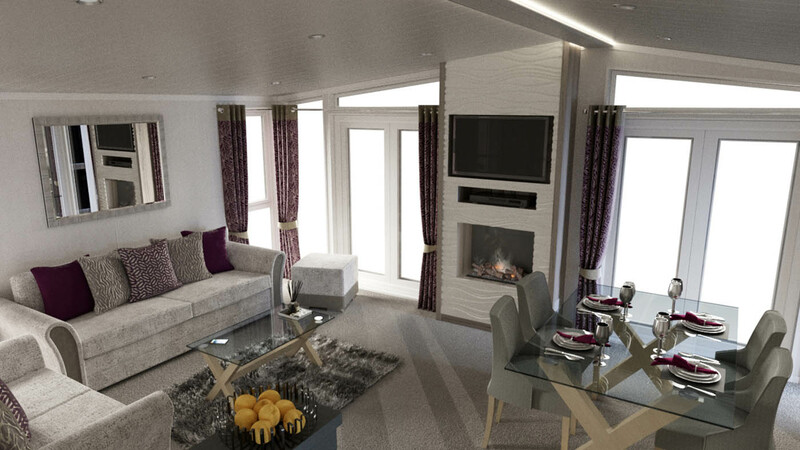 For our customers who relish that luxurious feel and contemporary styling, the Whistler Lodge is for you. The 20ft wide generous living space has an open plan kitchen, dining and living area plus two spacious bedrooms. There is even a utility room. The interior is designed with the “Hampton” soft furnishing scheme and luxury carpet with underlay that gives a great homely feel. The lounge has free-standing 2 & 3 seater sofas, a fold out ocassional bed and scatter cushions. Plenty of room to lounge and relax with a glass of your favourite wine on the glass top coffee table. The Opti-myst feature flame fire (no heat) offers a lovely focal point set within the feature wall. Here too is your Sony 40″ TV and Sky+ connection with HDMI cable. If you fancy listening to music, your Bose sound system provides excellent quality. Also featured within the lounge area is a full height feature radiator and wall mirror. Bi-fold doors to both sides and floor to ceiling window maximises natural light. A modern Cooke and Lewis “Raffello” full gloss kitchen with handleless doors will be the envy of your guests as well as providing lots of practicality for preparing delicious meals. Included are a glass fronted oven and grill, CDA lift up extractor fan, 5-burner gas hob with central “Wok” burner, an “A+” rated integrated 12 place setting dishwasher, microwave oven, wine cooler and 40mm laminate work tops with matching upstands. The drawers are soft close and there is under cupboard worktop and plinth feature lighting as well as a Dinette feature wall to again bring a touch of stylish ambience. An island unit / breakfast bar with 2 stools plus a glass topped dining table with four chairs provide plenty of scope to sit and eat together. The utility room next door to the kitchen / dining area has boiler, sink and integrated washer dryer. 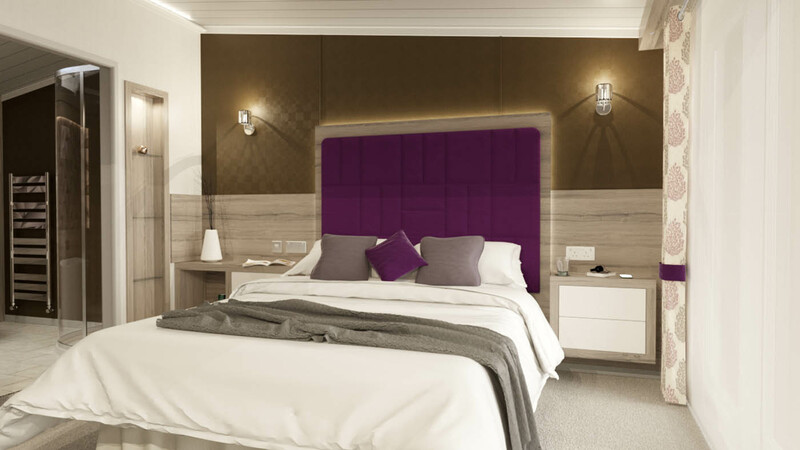 The spacious bedrooms each have co-ordinated furnishing and Duvalay mattresses as well as padded headboards to make it more comfortable for you to sit up in bed and read by the light of your LED reading lights. There is ample storage for your belongings with bedside cabinets and over bed cupboards. The King-sized bed in the Master bedroom has lift up storage and an illuminated feature panel above the bed. Decorative wall panels in the Master bedroom bring depth and texture to your decor. Thre is provision fo 32″ flat screen TV in the master bedroom and 15″ flat screen TV positions in other bedrooms with 230V and co-ax sockets. 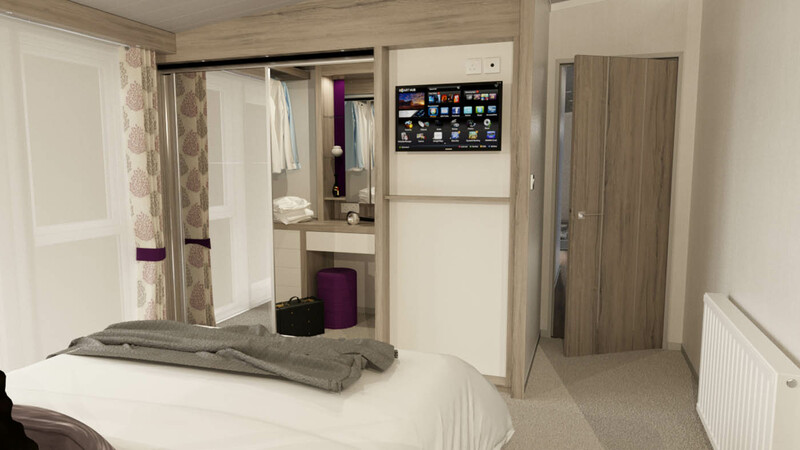 The wardrobe to the Master bedroom has sliding glass doors with socket behind and LED lighting. 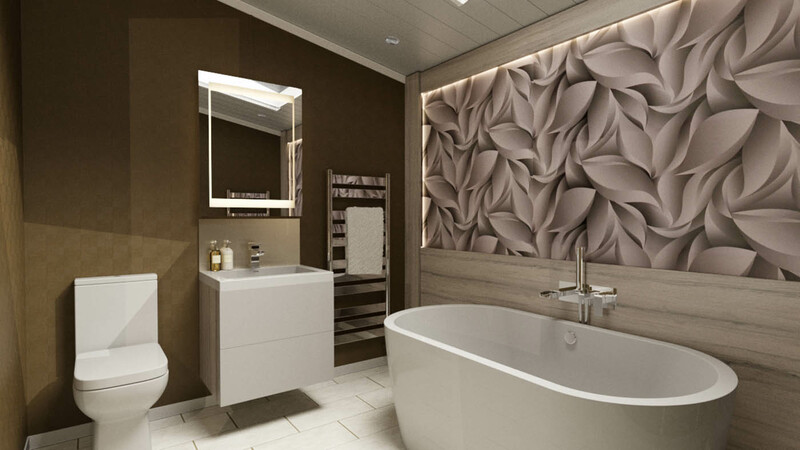 There is also a vanity area with mirror and socket as well as LED lighting to pelmets. A walk in shower enclosure with feature wall panel and bath in en-suite to Master bedroom finishes your little piece of heaven with sophisticated style. The modern family shower room has towel radiators, illuminated vanity mirror with infrared sensor and demisting pad, Stone effect vanity splash backs and shaving light as well as the essentials such as shower cubicle with thermostatic shower and Dual flush WC with new soft close toilet seat (concealed cistern in main shower room).